Nazwa.pl Review 2019: Is Nazwa.pl a Good Hosting? Nazwa.pl is a leading Polish domain registrar with millions of customers. With beginner- and expert-friendly features, and good resource allocations, its SSD plans are hard to fault. It’s just a pity the live chat operator wasn’t trained to answer all my questions. Nazwa.pl (Name.pl in English) is one of the leading Polish domain registrars, but not one of the top hosting providers. That said, it has gained more than 1,000,000 customers since it launched in 1997. The Nazwa.pl website is provided in Polish. Nazwa.pl uses four data centers located in Krakow, Warsaw, Frankfurt, and Amsterdam. The shared hosting plans use an ISO/IEC 27001 certified Tier IV data center, which means you can expect less than 26 minutes of downtime per year. The servers use NVMe SSD storage that is 10x faster than SSDs and 100x faster than traditional HDDs. Since the storage and other infrastructure is so solid, it seems a little strange that the 99.90% uptime is not backed by an SLA. This provider’s packages come with a one-click installer for popular programs such as WordPress, Joomla!, and Drupal, but there is no website building tool that would be useful to beginners. For advanced users, there is support for PHP, Perl, and Python, plus FTP accounts and MySQL databases. All plans come with Cron jobs for scheduling scripts, and the highest-tier plan includes SSH access. Security features include DDoS protection, web application firewall (WAF) protection, Kaspersky Internet Security, anti-spam and anti-virus for emails. The package prices are very low, and (understandably) you can only purchase plans on one-year terms. If you want a free .pl domain, you’ll need to select the highest package. To get 24/7 customer service, you can contact Nazwa.pl by email, phone, and live chat. There is also a substantial help center containing video tutorials, help documents, and FAQs, but it’s frustrating that there is no obvious way to search by keywords. I contacted the Nazwa.pl support team via live chat to ask a simple question about their uptime SLA (if any), and was disappointed to discover that the live chat operator couldn’t help me. I was asked to send an email, which I duly did, only to be answered with “our sales and customer service support are available only in Polish.” This would obviously be a concern for international customers. Nazwa.pl is a large company that employs 300 people and has registered more than 4,000,000 domains. Apart from a live chat operator who was unable to answer my question, it’s hard to beat the SSD hosting plans with 99.90% uptime that come at a super-cheap price point. 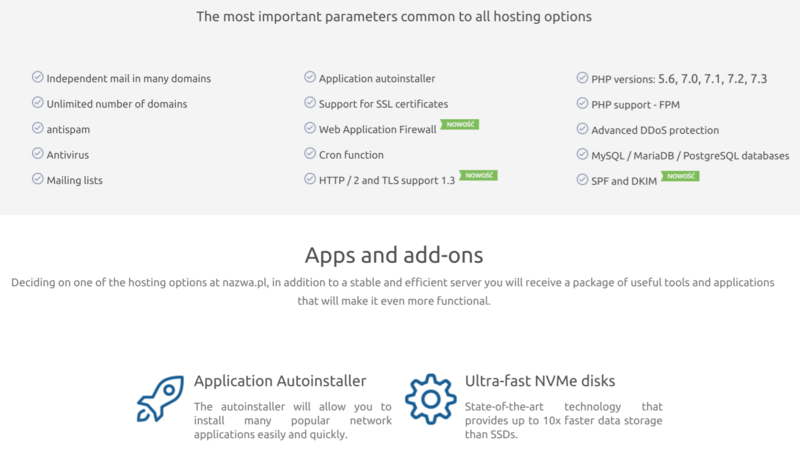 Wondering how Nazwa.pl stacks up against other Web Hosting companies? Enter any other Web Hosting company and we will give you a side-by-side comparison.